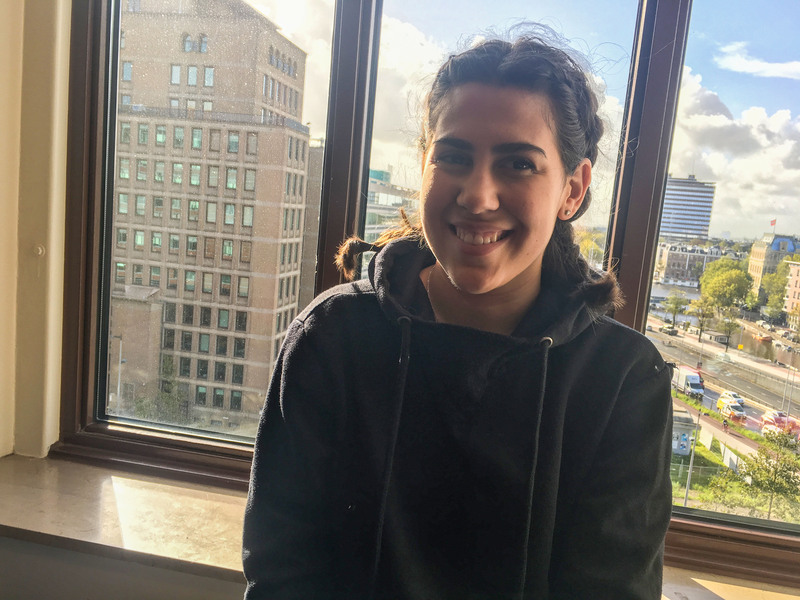 From the City of Love to the City of Freedom: Journalism student Marion Caspar from Paris just arrived in her new home in Amsterdam to start her year abroad. Sitting on a bench by the popular Prinsengracht in Amsterdam, all alone at 10 in the morning, listening to music and watching the boats passing by – this is how Marion Caspar pictures her perfect moment. The young French girl just started her exchange semester in the city of Amsterdam, and despite all the buzz around meeting new people, she definitely is a person who needs some time on her own. She came to the Dutch capital for a minor program called International Journalism, which will be a part of her bachelor’s degree in Journalism. The 20-year-old does her regular studies in Paris but decided to leave the City of Love for two semesters – mainly to improve her English skills. “Right now, I speak better Spanish than English“, she admits. The best way to learn the language, she assumes, will be to write journalistic articles. Nevertheless, she is not going to study Journalism for the whole year. In her second semester in Amsterdam, she will be taking Global Trendwatching, instead. The course sparked her interest mainly because she likes to focus on specific trends and to analyze them. “Actually, I’m not much of a creative person“, she says. She sees herself more of an analytical thinker. It is this attitude that determines her personality. Marion is not a person for planning, she just likes to try and find out what feels good for her. She is not working towards a certain goal, but she is sure: “When I really want something, I can move mountains.“ And, most importantly, she says: “I consider myself a very happy person.“ Not only when sitting on a bench in Amsterdam, that is.